“They also serve who only stand and wait”, was a favourite quote of an Irish umpire, long passed. He would hardly recognise the duties of the modern official however, with standing and waiting the least of their worries. Umpiring is essential to the smooth running of the game, and for many years it was the work of the retired professional player, who were barely tolerated by those in authority. Up to the 1960s umpires were not permitted into the Phoenix club bar, forced to wait outside for a grandee to come out and hand them their five shillings (about 30c). In 1961 officials went on strike, refusing to stand for a paltry sum and demeaning treatment. Nowadays the fee is €45, still a pittance for nine hours work, plus travelling time. 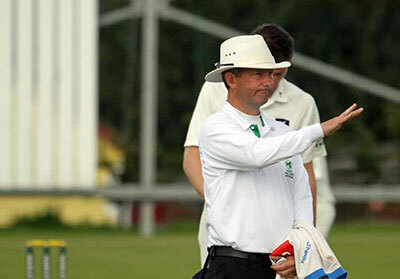 There are about 150 umpires in Ireland, almost half in Leinster where the Leinster Cricket Umpires and Scorers Association covers around 850 matches per summer. The LCUSA recruits about a dozen new officials a year, conducting short courses on the laws before a winter training programme. Many are those keen to stay involved when their playing days are coming to an end. The practice of the batting team providing umpires also brings in people such as Reynolds. Tuffery, a retired university lecturer and author of ‘Thinking About Cricket Umpiring’, has been involved in umpiring for almost 40 years and now focuses on training and assessment. “Back in the 1980s we had no formal training: some trained in the UK or travelled to sit exams. We only umpired at Senior 1 and 2, but fortunately players were very forgiving of those who like me were learning on the job. But such sentiments – and international progress – cuts no mustard with some. “The standard is very poor, the worst it has been in 30 years”, said one senior club player. “The problem is that umpires won’t make decisions, which they think is the best way to make progress. Declining standards of player behaviour has not helped, although that works both ways. One, now deceased, Dublin umpire was irritated by a batsman using “his” bail to mark his guard and unleashed a flurry of punches to make his point. Another Dublin umpire, Mary Waldron, stood in the recent men's ICC Europe WT20 Qualifier, drawing wide praise. 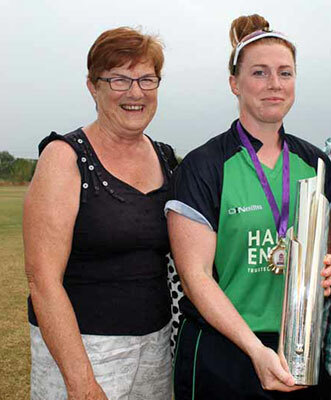 Waldron is not just still a player – she’s preparing hard for November’s World T20 in the Caribbean where she’s keeping wicket for Ireland. She first umpired during a winter job helping establish the Tasmania U17 girls’ team. Waldron, also a soccer international and hockey interpro, winters regularly in Australia and two years ago became the first woman to stand in First Grade in Adelaide and umpired at two underage national championships. Her hero is Joy Neville, a rugby referee progressing fast in a hitherto man’s world. “She is really blazing the way for women and I am so proud that she is Irish. Nothing seems to phase her. Waldron has 112 caps as a wicketkeeper/bat but at 34 she’s keen to postpone the hard decision. “In umpiring I’m told I need to stop playing but I want to keep playing as long as I can,” she says.